Okay, I think I've been living under a rock. Or I've spent too much time on the internet or reading books or watching "On Demand" TV series. Or all of those things. Am I babbling? The other night my wife and I were killing an hour between two favourite shows on TV. We flipped over to the Food Network and watched that great old stand-by "Chopped". But this is the Canadian version hosted by Tori Spelling's husband Dean McDermott. Anyway, I think it was the entree round and when the chefs stuck their hands into their mystery boxes - yes I know how that sounds - they came up with broccolini. Brocco whatee? I turned to my wife and asked "Do you know what that is? She said I think it's broccoli and asparagus". I said "Then why don't they call it Broccagus?" She said "I don't know. Shut up, I'm watching this". I have to say this is a habit of mine. I always talk while we're watching something. In a movie I'll lean over and say "Hey, that's that guy from That 70s show isn't it?" Drives her nuts. And yet I'm still alive to do it again and again. Love is strange. So it's not asparagus. I looked it up. It's a hybrid of broccoli and kai-lan. Yeah, that's Japanese. Apparently it's great in stir-fry. Who knew? So while we're on this babble thing I started thinking about this "ini" business. What's up with that? The one thing that immediately came to mind was spaghettini.Yeah, now as if spaghetti pasta wasn't thin enough someone had to go and make it thinner. Jerks. And while I'm babbling here why did they go and make Coronita? It's a Corona, only smaller. Who wants a smaller beer. Hell, here in Quebec you can buy a man's version of Corona in quarts - the bottle not the gem, although Corona is a gem of a beer. Speaking of little things. This is all too much for my little mind to take in. Pour me a Coronarita, will ya? Wanna join me? A couple of these and I'm sure we'll babble all night. 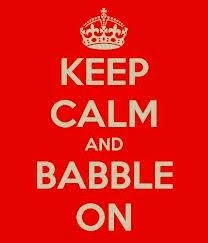 "Babble" was this week's prompt over at Studio30Plus. Skip on over there and see what all the commotion is about. That's a bubbling, babbling, bunch of broccolini, Buster Bray. I think I'll stick to a simple shot of tequila with my blogotini, whatever that is. I just made it up. A few of those Coronaritas and I'd be babbling, too! 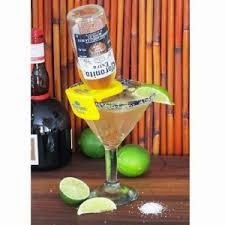 I didn't even know those martini's existed until I looked up Coronita. We should try some of those at the next #lostmyliverpalooza. I'll even spring for those fancy little bottle holders. We'll drink them while we're having our broccolini and dip. I love that Maryse hasn't killed you yet. I'm pretty sure Rick is on the verge of making me into Cherylini and burying the pieces if the ground ever thaws. Funny, in our house I had to hide all the sharp objects for fear Maryse would make me into Johnalini. I babble during TV, too, and say "isn't that..." During the Walking Dead,that's a huge no, no in our house. Having not so long ago suffered through a bunch of kids' shows with a little one before he went to Kindergarten, here I was thinking you meant a Nick Jr. show. Barbie beer...I love it, Jayne. I always thought that part of coupledom was sharing your inner most thoughts with your partner. Alas my partner doesn't think that extends to while watching TV or movies. I know exactly what you're talking about, Lauren! Never got into that show for some reason even though my wife thinks sometimes I'm walking dead. We love animated films like Shrek and the like. And yes,I'm talk though those too like "hey, isn't that voice John Cleese?" She hates when I do that. That's some good babble, there - and I can absolutely relate to the mid-movie (or TV show etc.) babbling. I do it all the time. Luckily, [Maris] does, too. One of our favorite inventions of the digital age is the button that lets us rewind live TV. I hate that button. I always go too far back then too far forward to try ad catch up, then too far back again. Just saying'.